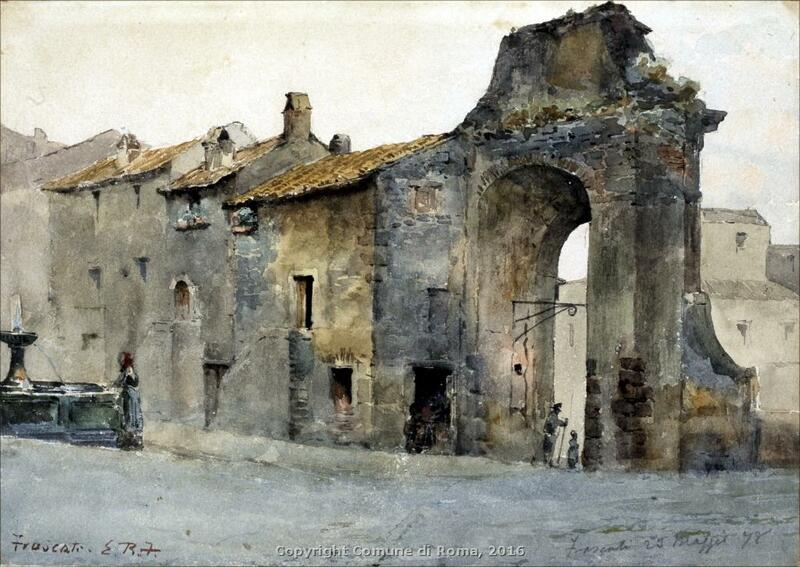 119 Watercolors of “Vanished Rome” collection owned by the City of Rome. 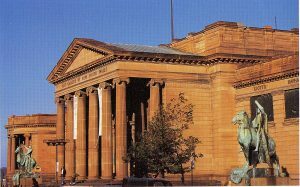 Initially they were 120, but 1 watercolor was stolen in 1966 in Cologne (Germany) during an exhibition. In “Vanished Rome” section you can find more info about that. Part of the collection is permanently exposed. 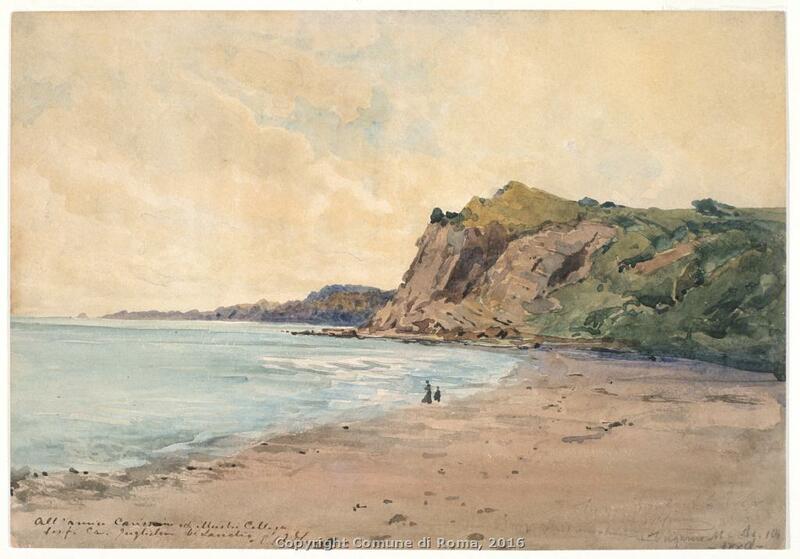 4 Watercolors owned by the Municipality of Rome titled: “Cove of the coast with characters” (24.4×35 cm),“Ancient gate of Frascati” (18.6×8.3 cm) 1878, – MR 6340, Torre medievale trasformata in casale (28,1×20,4 cm) 1892 – GS 2019 e Rive del Tevere all’altezza di Campo Marzio (28,1×20,4 cm) 1892 – GS 2036. They are also visible in Other watercolors section of this site. 1 Watercolor (63.5×92.5) depicting King Victor Emmanuel II of Italy in his first visit to Rome on 31 December 1870, while the city was flooded by the Tiber. The watercolor is visible by clicking here and it is permanently exposed. 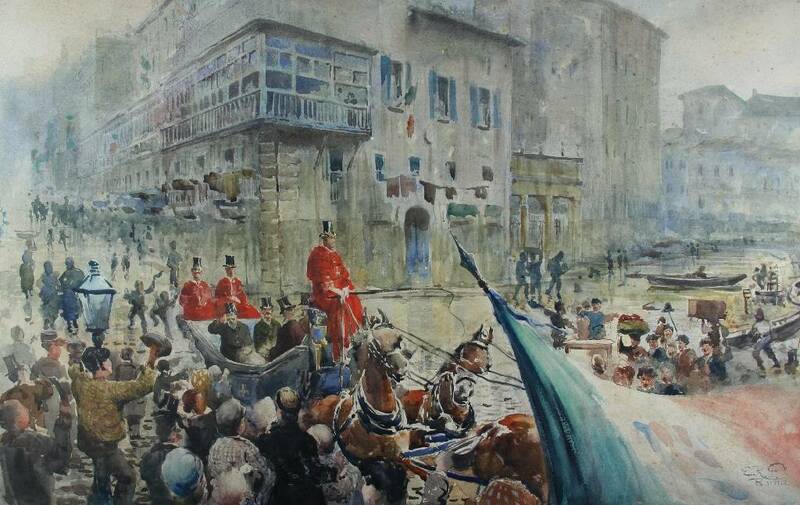 It depicts the passage of the King Victor Emmanuel II in the carriage as he crosses via del Corso towards piazza del Popolo, around piazza San Lorenzo in Lucina, completely flooded (note the boat on the right). 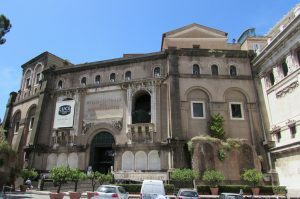 It was the 1st official visit to Rome by the King, 100 days after the seizure of Porta Pia. 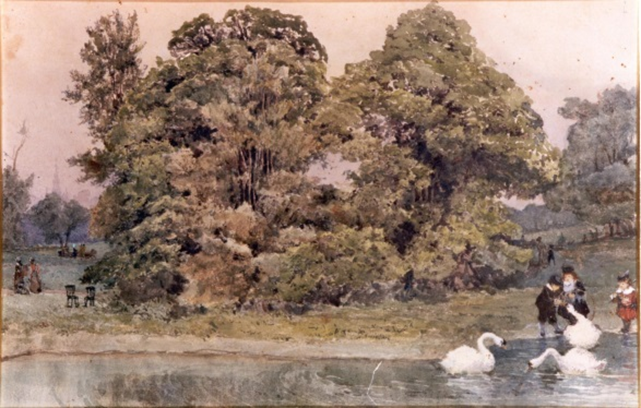 This watercolor, however, was executed by Ettore Roesler Franz only 13 years later, in 1883, as last preparatory sketch for a painting no longer completed. Ettore was a witness of the scene portrayed, because on 23 December 1870 he was appointed second lieutenant of the National Guard and was present at the passage of the King in the carriage. 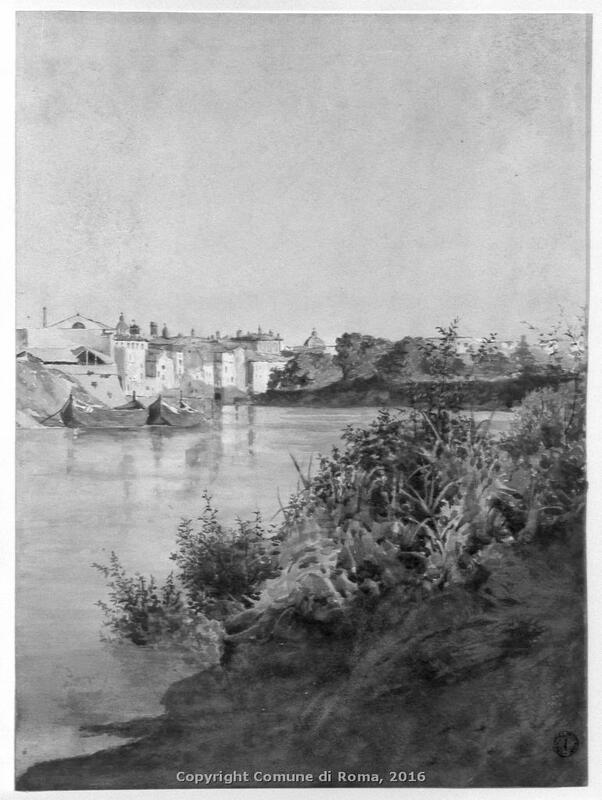 It’s a of particularly important picture for the whole work of “Vanished Rome” because it was on that occasion that the King decided the construction of embankments on the Tiber River to prevent further flooding in the capital and, shortly after, works of demolition along the banks of the river started. 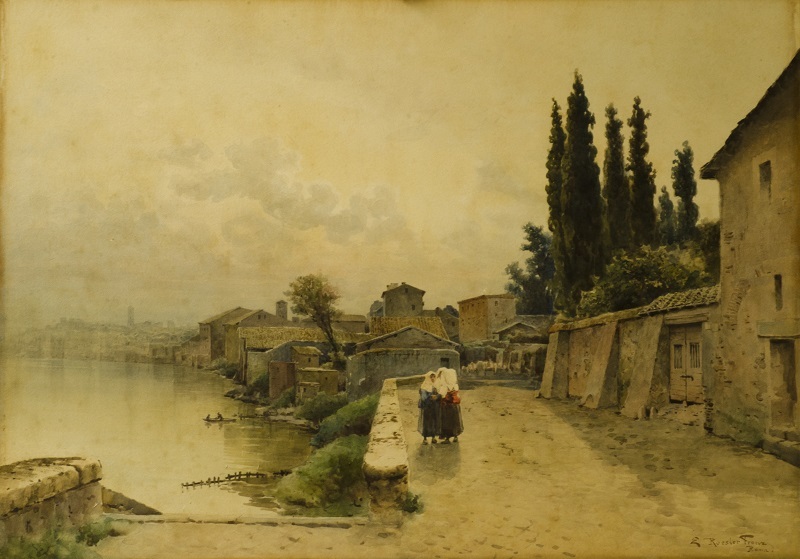 This watercolor was exhibited in Turin in 1884 at the Esposizione Generale Italiana, the history section of the Italian Risorgimento, and then in Rome in 1932 at the Istituto di Studi Romani “View of Rome in the nineteenth century” and, most recently, in the exhibition at the Museo di Roma in Trastevere in 2007, for the 1st Centenary of Ettore Roesler Franz’s death. 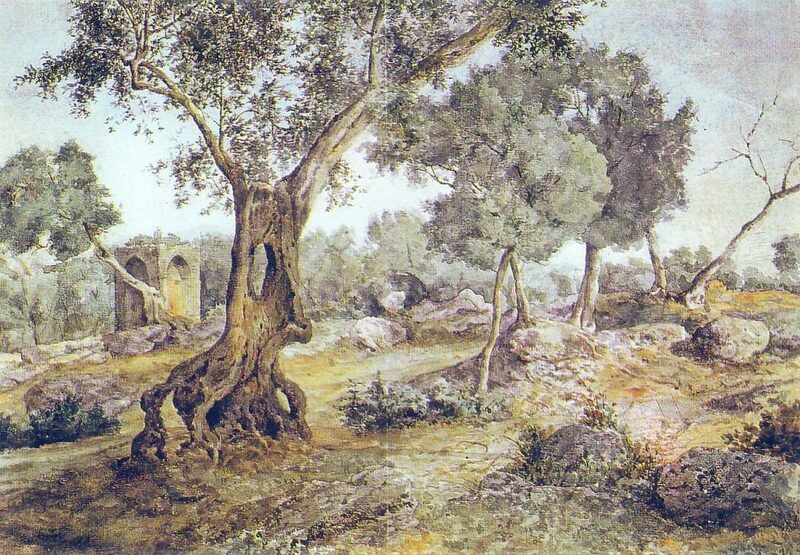 1 Watercolor named “Cypresses of Villa d’Este, Tivoli”. 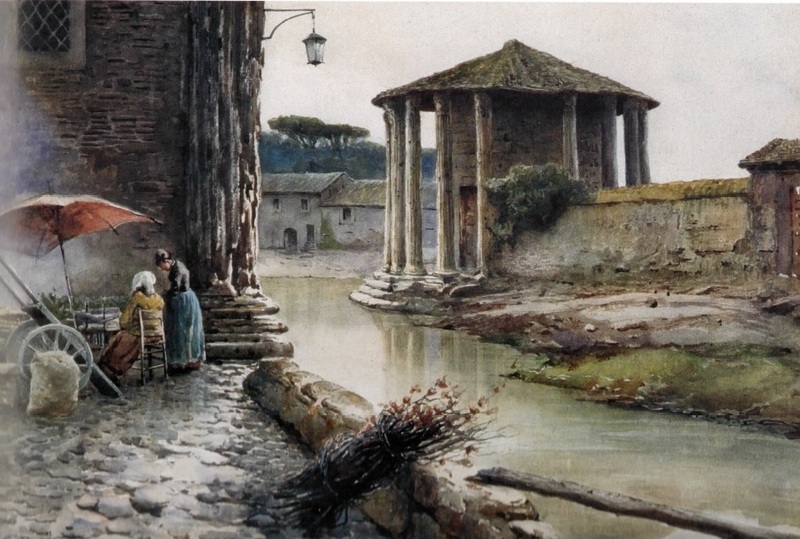 2 Watercolors entitled “Riverside in Rome“ (54.3 x 75.7 cm) and “In the Garden, Villa d’Este” (44.5 x 77.5 cm), 1893. 1 Oil named “Venetian Scene” (40×29 cm), 1888. 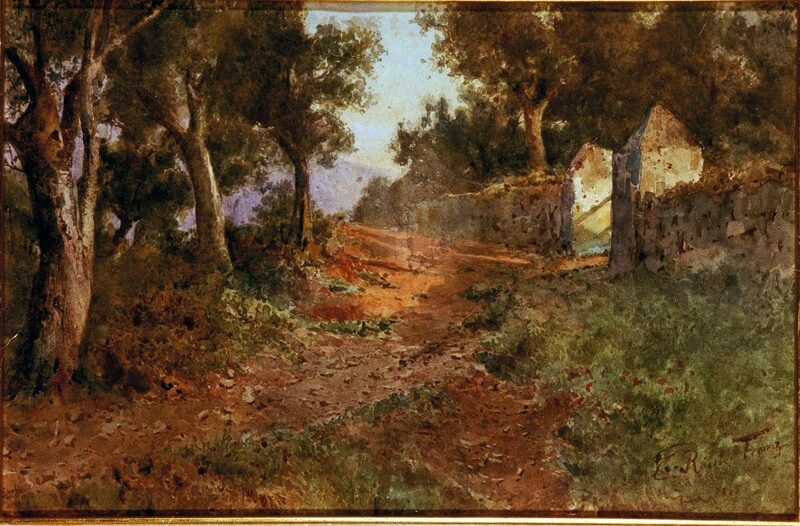 1 Watercolor titled “Begins the day by flattery” (73.4×31.7 cm, signed on the left). 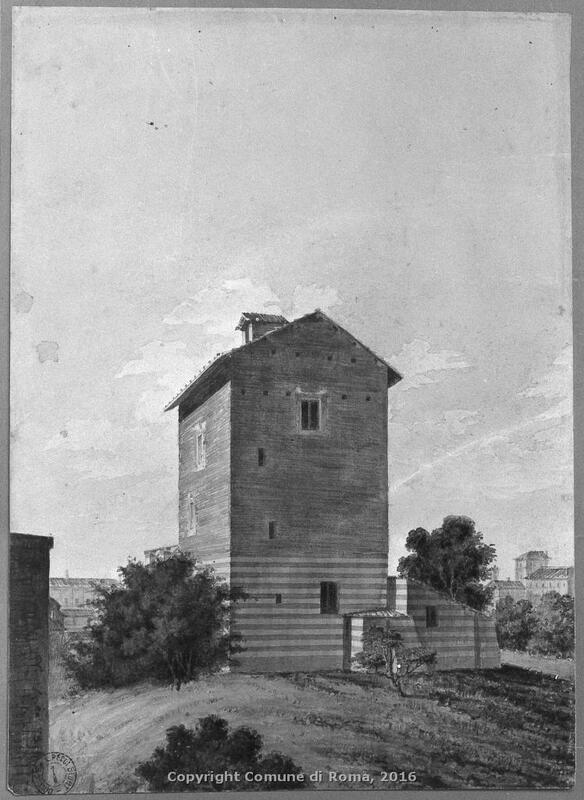 1 Watercolor named“Torre della Scimmia” con palazzo Scapucci (54×36 cm), 1893. 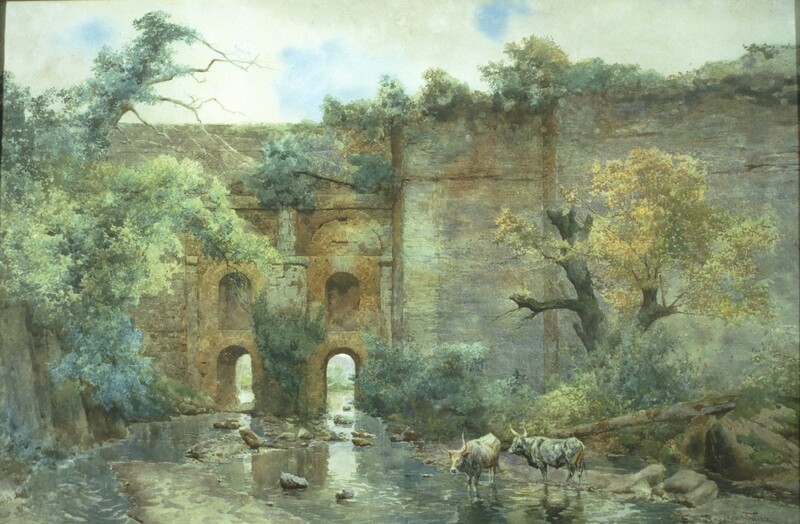 1 Watercolour depicting “Ponte Lupo – Poli” (66×102 cm, 1898) owned by the Municipality of Tivoli and today placed in the Mayor’s Office. 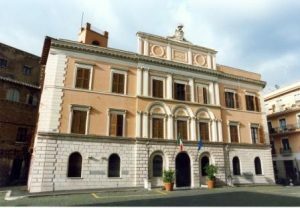 The painting was donated by Ettore Roesler Franz to reciprocate the Tivoli Municipal Council for the beautiful illuminated parchment by Giuseppe Cellini (12/9/1855-4/29/1940) given to him after having received unanimously the honorary citizenship of Tivoli on 6 February 1903. 3) “The Garden of the Lake – Rome” (30×45 cm – inv. 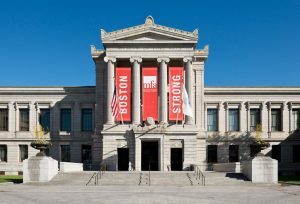 400532). 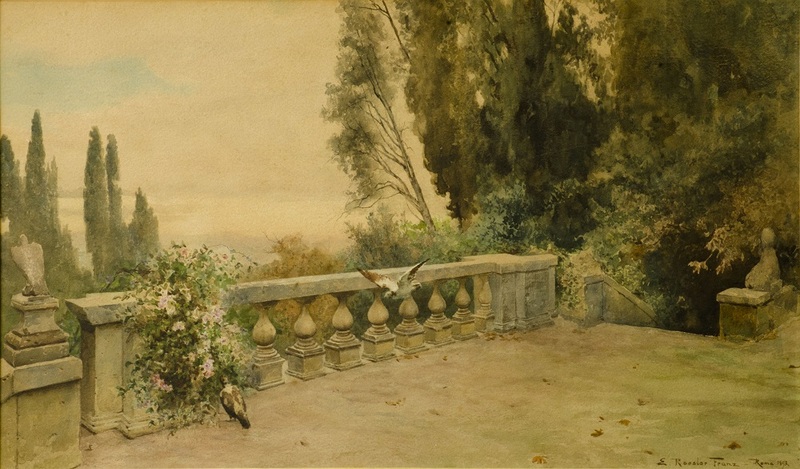 3) “Stairway of Villa d’Este in Tivoli”, 1890-1900 (inv. 11397A – 32×54,8 cm). Among its “excellent” clients there are Her Majesty the Empress Dagmar of Denmark, widow of Tsar Alexander III of Russia, and his son Grand Duke George Alexandrovich who bought 2 watercolors: “Terraces in Villa d’Este in Tivoli” and “Holy Wood of Ninfa Egeria along via Appia”. 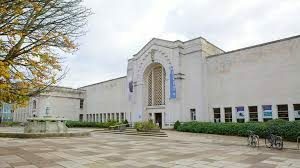 In addition to them, among the buyers of the artist’s work during his lifetime there are famous personalities of the House of Savoy: King Victor Emmanuel II, Queen Margherita, her husband King Umberto I, their son King Victor Emmanuel III and the Grand Duke Louis of Hesse, in fact, purchased 5 watercolors and 6 pastels. 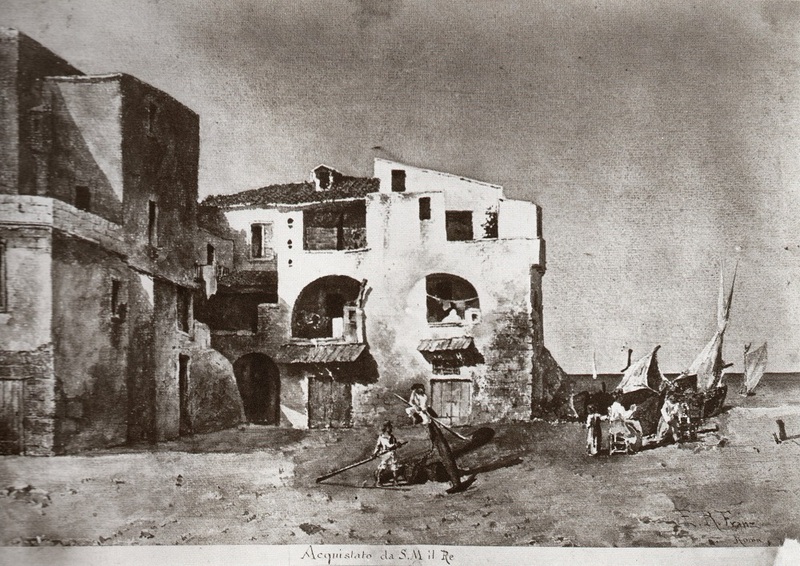 Among the titles of these watercolors we have “Sailormen’s house in Sorrento” (1876 – here the b/w photo of the picture taken by the Artist), “La foce dell’Arrone” (1876 – here the b/w photo of the picture taken by the Artist), “Remnants of Saxula”(1898), “View of Villa Adriana in Tivoli” (1904) and “The fog raises” (1904). 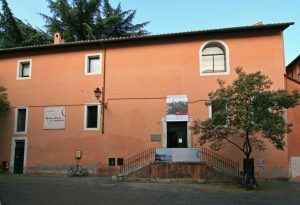 Here you can find the volume “The inventory of Queen Margarita” where it is written that the Queen bought the 6 pastels between 1892 and 1893 and it is given that the Queen bought “La foce dell’Arrone” at the Exhibition of Società degli Acquarellisti in 1876. 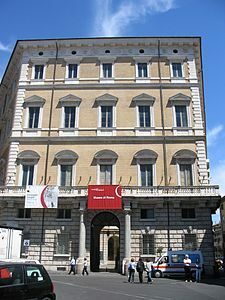 Furthermore, other 6 watercolors were purchased by the at that time Finance Minister and renowned italian statesman Quintino Sella.